Sony has deconstructed its best smartphone and put it back together into something amazing. The Xperia Z1 (codename Honami) is a powerful, camera-centric flagship backed up by the QX line of attachable camera modules and the SmartWatch 2. The Sony Xperia Z1 takes some of the highlights of the original Xperia Z - the gorgeous OmniBalance design, a 5" 1080p screen, water resistant body - and kicks everything else into overdrive. The major crowd puller is the 20.7MP camera with G Lens and big 1/2.3" sensor, but the display tech is new and improved and the Snapdragon 800 chipset is the current chart-topper. The 1/2.3" sensor is as big as what most point-and-shoots have, as well as the Samsung Galaxy Camera and Galaxy S4 zoom hybrids. True, it's smaller than Nokia's 1020 PureView imager, but Sony didn't compromise the build - the Xperia Z1 is 8.5mm thick throughout, there are no humps to hurt pocketability (and desirability). Today, top cameras are put on top phones and you pay for both. Plus, even the ones with impressive imaging credentials like the Xperia Z1 lack the optical zoom or stabilization of dedicated cameras, which on the other hand come short of features and apps, not to mention skimp on screen size and resolution. Enter the new QX line of lens-style cameras that allow you to enhance any smartphone with a 10x zoom or a large 1" sensor borrowed from Sony's acclaimed RX100 II camera. Each QX camera contains its own lens, image sensor and battery and uses NFC and Wi-Fi for pairing and communication with the phone. Blinking lights have performed notification duties for almost as long as there have been mobile phones. Color lights and active screens have allowed phones to communicate more information, but they still do nothing when the phone is in your pocket. With the SmartWatch 2, Sony is continuing its push to make notifications richer and more accessible (it's always on your wrist), while at the same time allowing for more info to be displayed and giving you more controls, all in a single stylish package. 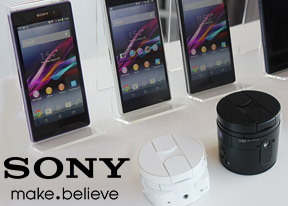 This year at IFA, Sony is reimagining the future - in the year 2013 you won't need to pull your phone out of your pocket to read a new message or pay the flagship premium just because you want a good camera. And if you do pay for the flagship, the Xperia Z1, you'll get the bleeding edge in smartphone tech. Join us on the next page as we take the Xperia Z1 and its crew for a spin. whats the difference between the camera of the z1 compare to the qx100 anyone? should i get the lens as well?